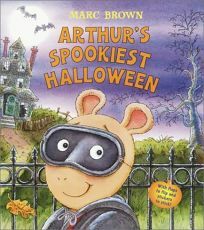 Marc Brown's Arthur dons mask, cape and pointy ears to masquerade as a vampire for the oversize board book and lift-the-flap Arthur's Spookiest Halloween. Kids can help Arthur prepare for his party by taping ""three creepy cats"" to the door, then open it to find D.W. arriving with a tray for five candy apples-readers use a sticker of the quintet of fruits to fill it up. Other fun stickers include a skeleton, jack-o'-lanterns and trick-or-treat bag.